Advising lets high-level academic users and faculty advisors keep an eye on student performance. You can read about what you can do in Advising here. This article covers the setup steps that help your school get the most out of these features. They can register students for courses on the Profile > Registration screen during online enrollment periods. They can view contact information for their Advised students. To give someone the Advisor role, follow the instructions in this article. Advising information is based on whether or not your students have Advisors in the first place! There are a few ways you can assign Advisors to your students. 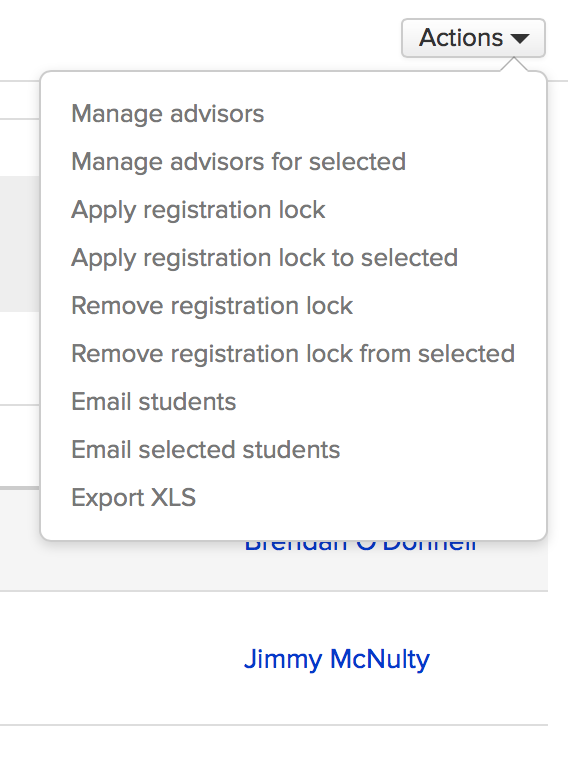 This option lets you add one or more Advisors to groups of students using the Manage Advisors action in Advising or the Data Slicer. Go to either Advising > Students OR Academics > Reporting > Data Slicer. Use the filter in the Advising report and check off individual students for whom you wish to change the Advisor. If using the Data Slicer, use the filter to run a report (or load a pre-saved report). Next, on either report, click Actions and select Manage Advisors. For the Action, select Add. 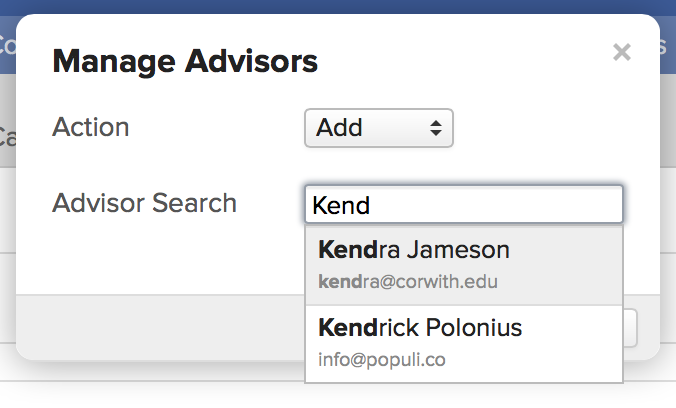 Type the name of the Advisor you'd like to add and click the name from the suggested results. Repeat step 5 to add multiple advisors. Click to remove anyone you've added in error. You can also remove Advisors in bulk; for step 4, just select Remove as your Action. This option lets you add Advisors to students one-by-one. Go to the student's profile and click the Student tab. 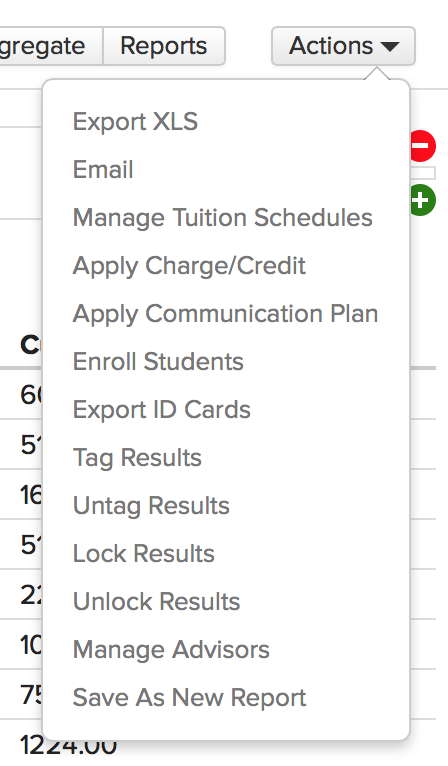 In the right column, click edit next to Student Information. Repeat step 3 to add multiple advisors. Click to remove anyone you've added in error. Academic flags provide a warning system to help you catch students who may be running into trouble. They're triggered by attendance stats and assignment grades that fall within certain ranges. You establish these ranges in Advising > Settings. James Smith has perfect attendance (green), an average assignment grade of 82 (yellow), and a lowest assignment grade of 57% (red). At this point, he'll have a red flag on the Advising > Students report. The report always shows the most serious flag. James' Advising page will show both the yellow and red flags. The Advising page lets you see all flags, which can be Active or Inactive. Inactive flags are those that have been resolved or have somehow expired. James has a great couple of weeks in class and aces his quizzes, bringing his average assignment grade up to 93. The yellow flag expires and is replacedThe red flag nonetheless remains because of that low grade of 57%. James' hot streak in class continues three more weeks. His average grade is 94%, and as soon as 30 days have elapsed since that 57% grade, the red flag is replaced by green. If things hold steady for James, the green flag will persist until the course(s) in question (for which he received those assignment grades) are finalized. To establish flag thresholds, you need to have the Academic Admin role. Go to Advising > Settings. Click edit next to Flag Thresholds. Enter the % values for each warning category. You should likely consult your grade and attendance settings. While you're free to enter whatever you please in these fields, remember that this is a warning system. So if a student fails for attendance at 75%, you should enter something like 0% to 80% for the red flag under Attendance Percent. If 65% results in a course failure, then you should enter something like 0% to 70% for the red flag under Average assignment grade. And so on. The fields in gray are auto-filled based on your entries in the adjacent fields. For example, entering 75 for Yellow/Lowest assignment grade will auto-fill 76 for the minimum value for the green flag. After you save, any Advisor can view (but not edit) the flag thresholds. Any Advisor can come here and opt-in to receive an email notification when one of her students is flagged. Click edit next to Notifications. Check which flags about which you wish to be notified. What if we don't use the attendance feature and do not want to receive the notification for it. Is there a way to separate attendance from grades? Martha, if you're not using the Attendance features, then there won't be any data to trigger a flag—Populi assumes everything is excused until you tell it otherwise. So, as long as faculty aren't taking attendance, there shouldn't be any danger of triggering a flag.